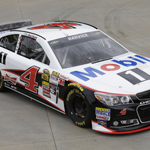 "Kevin Harvick has had a brilliant year and is a strong contender to win the 2014 Sprint Cup Series title"
CHARLOTTE, N.C.--(BUSINESS WIRE)--ExxonMobil is expanding its Mobil 1 partnership with Stewart-Haas Racing, adding a one-time full primary sponsorship of Kevin Harvick’s No. 4 Chevrolet SS for the GoBowling.com 400 NASCAR Sprint Cup Series race Aug. 3 at Pocono (Pa.) Raceway. 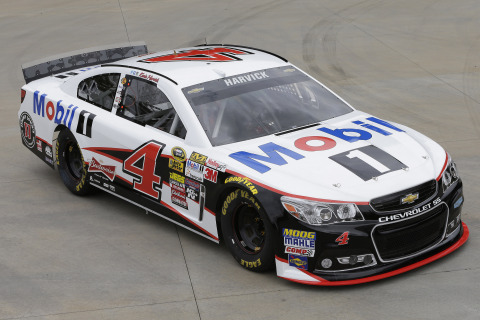 Supported by Mobil 1 lubricant technology, Harvick has earned two wins, five top-five and nine top-10 finishes since the beginning of the 2014 season. Harvick is currently 12th in the championship standings and virtually assured to qualify for the Chase for the NASCAR Sprint Cup under the new format, where the top spots in the 16-driver field are awarded to those who have won a race prior to the 10-race Chase. To build anticipation for the Pocono race, a video showcasing Mobil 1 as Harvick’s new full primary hood is now available on the Mobil 1 Facebook page. The video shows Harvick sneaking into the Stewart-Haas Racing shop to capture some of the Mobil 1 mojo that brought Tony Stewart the 2011 Sprint Cup championship. The video then reveals Harvick’s special No. 4 paint scheme for Pocono. For remainder of the 2014 season – five regular-season races and 10 Chase races – Budweiser and Jimmy John’s will remain primary sponsors of Harvick’s No. 4 Chevrolet SS. Bass Pro Shops and Mobil 1 will remain as co-primary sponsors of Tony Stewart’s No. 14 Chevrolet SS. In addition to partnering with Stewart-Haas Racing, the 2014 season marks the 12th consecutive year in which Mobil 1 will serve as the “Official Motor Oil of NASCAR.” With a deep history in motorsports, Mobil 1 is used by more than 50 percent of the teams in NASCAR’s top-three series. The Mobil brand’s history in motorsports officially began in 1979 with a sponsorship of Williams Formula One Racing Team. From that time, the presence of Mobil 1 technology on race tracks and circuits has grown by global proportions. Today, Mobil 1 synthetic motor oil is relied on for its ability to deliver exceptional engine performance and protection even under some of the most extreme conditions by team owners and many of the world’s leading automotive manufacturers. Along with its status as the Official Lubricant Technology Partner of NASCAR, Mobil 1 enjoys a long association with many of world's most popular and successful race teams, including Stewart-Haas Racing in NASCAR’s Sprint Cup Series, McLaren Mercedes’ Formula One team, Corvette Racing’s Tudor United Sportscar Championship team, Tony Stewart Racing in the World of Outlaws Sprint Car Series, as well as the Porsche Mobil 1 Supercup—the world’s fastest international one-make series. Stewart-Haas Racing is the title-winning NASCAR Sprint Cup Series team co-owned by three-time Sprint Cup champion Tony Stewart and Gene Haas, founder of Haas Automation – the largest CNC machine tool builder in the western world. The team fields four entries in the elite Sprint Cup Series – the No. 14 Bass Pro Shops/Mobil 1 Chevrolet for Stewart, the No. 10 GoDaddy Chevrolet for Danica Patrick, the No. 4 Budweiser/Jimmy John’s Chevrolet for Kevin Harvick and the No. 41 Haas Automation Chevrolet for Kurt Busch. Based in Kannapolis, North Carolina, Stewart-Haas Racing operates out of a 140,000-square-foot facility with approximately 270 employees. For more information, please visit us on the Web at www.StewartHaasRacing.com, on Facebook at www.Facebook.com/StewartHaasRacing and on Twitter @StewartHaasRcng.